Lower your ride with out damaging your wheel alignment. Spherical bushings prevent deflection under load maintaining wheel alignment. So you spend good money on some KW Coilovers, but you forgot the last step. Lower control arms! 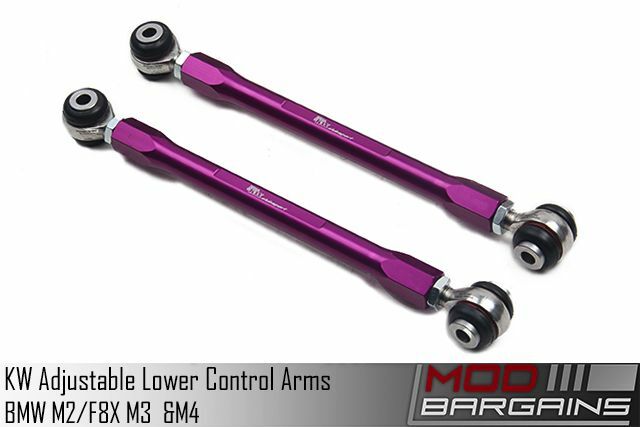 Whenever you lower your vehicle from stock, replacing these arms with adjustable versions is an absolute must. KW is known for their engineering and quality testing when it comes to all their products and these LCAs are no exception. Fully TUV certified and made in Germany, only chose the best when lowering your vehicle. These adjustable arms with spherical bushings are designed for Both the current F80/F82 M3 and M4, as well as the F87 M2 which shares the same suspension components as its larger siblings.